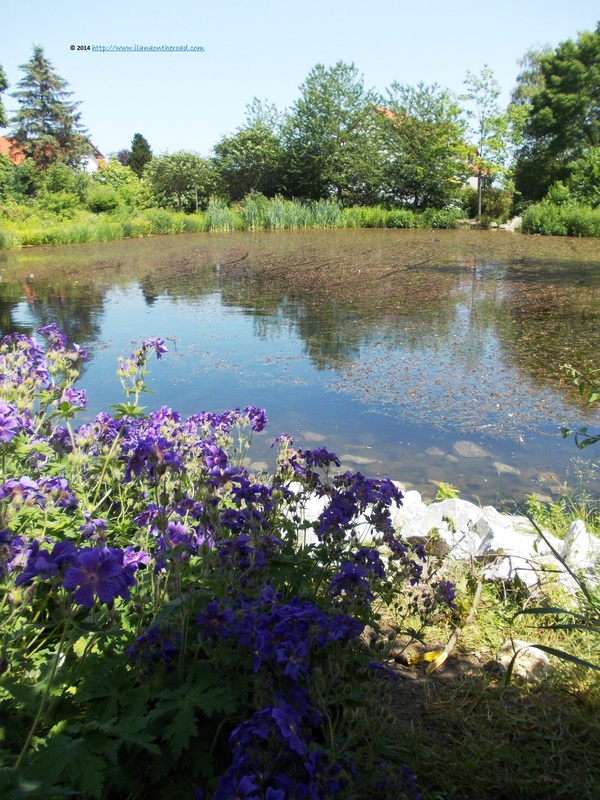 Summer in Germany is an exquisite event and the sooner I start the celebrations the better, as the same summer is also a stormy character, disappearing suddenly for good weeks, even months, especially when you expect the less. At the beginning of this months, my modest hopes for a hot sunny summer where higher than today, for instance, and encouraged by the intensive beams of lights, we took - again - the early HEX train direction Blankenburg. Passing through the most beautiful poppy fields I ever seen, we arrived in the small town. Except the people going to the 'Biological Outdoor Pool' there were not too many people out. 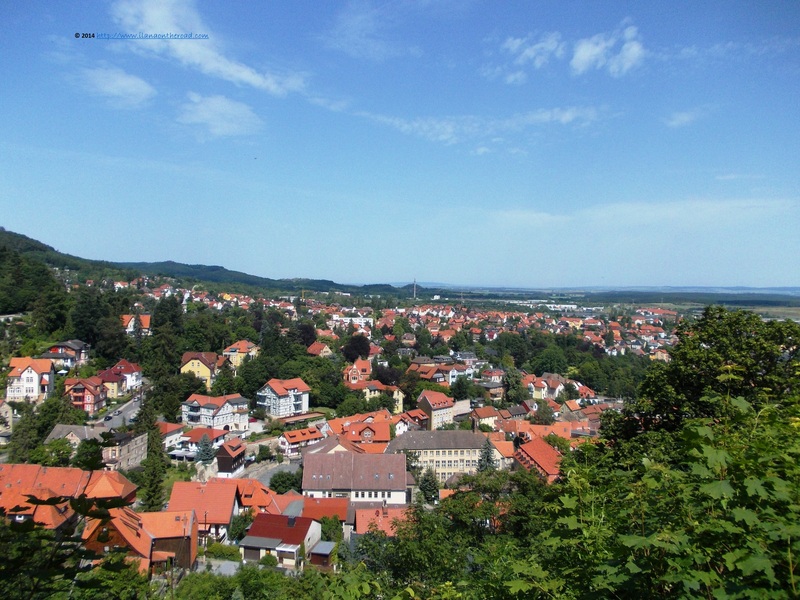 Without spotting tourist indications for a long time, we supposed that Blankenburg is such a precious gem that should be kept safe from the curiosity of visitors. 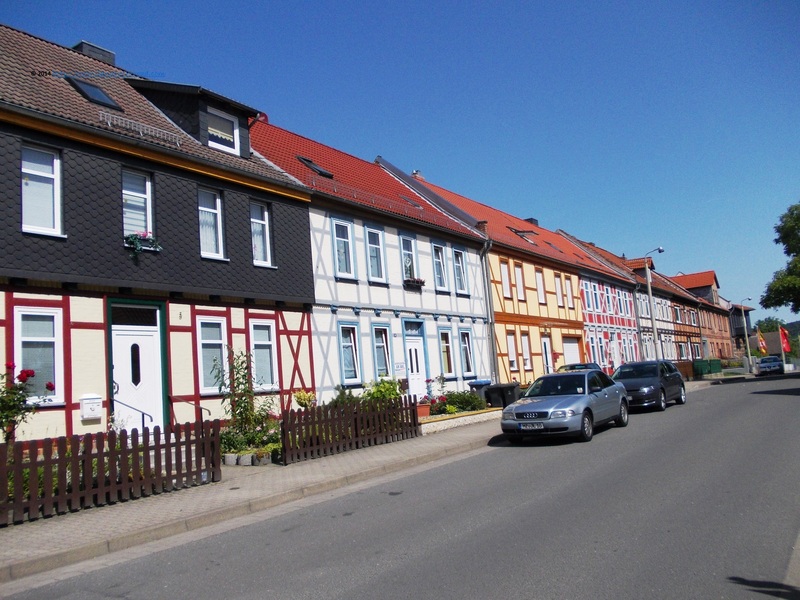 As soon as we recognized the colourful rows of classical half-timbered colourful houses, the trademark of Harz area and we felt we are somehow in a familiar place. Freshly painted in vivid colours, the houses are close neighbours with the old city wall, built in 1305. In its best times, it used to have around 19 towers and 4 gates, with heights varying from 5.30 to 7.80 m. The colourful flowers resting nearby, diminished a bit the warrior's seriousness of the walls, that used to defend the city from the outside intruders. The temperature is increasing rapidly it seems and we are trying to finish in a safe way our scheduled program. A walk from the small historical building of the city hall till the top of the hill, to the big castle - Grosse Schloss - is a good idea and the city looks like a chaotic lego game from the top. The castle was initially built in 1123, but went through various stylistic transformation during the centuries. The last one took place at the beginning of the 18th century. For our 21st century minds, Blankenburg doesn't say too much, but in the complicated game of European alliances of three centuries ago, the situation was more different. The oldest daughter of Louis Rudolf of Brunswick-Wolfenbuettel married the Emperor Karl VI, the father of Maria Theresa. Another daughter married the Tsar Peter the Great. At the beginning of the 20th century, the mother of the former Spanish queen Sophia, Frederica, was born in this castle. Those were the days. Nowadays, there is a museum and the yard is often used for theatre representations and festivals. 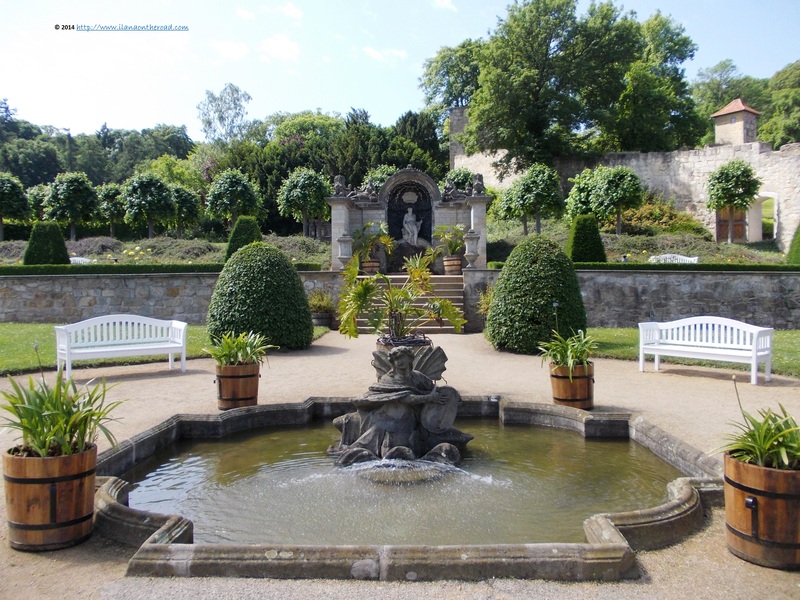 The most beautiful part of the castle are a couple of stairs away: the Baroque gardens. (Here is a short overview video presenting them in their entirety) The statues representing various aquatic mythological characters are placed in the middle or near waterfalls, bordered by flowers and asymmetrically cut gardens. At the end of the descent - in small stairs, at every level with a different landscape arrangement - there is a small castle, guarded by big statues. This is how many would imagine the educated pleasures probably at the time . It is not hot enough to discourage us to keep following the old cobblestone streets bearing names like 'Petersilienstrasse'/'Parsley street', with shops selling traditional and handmade products. 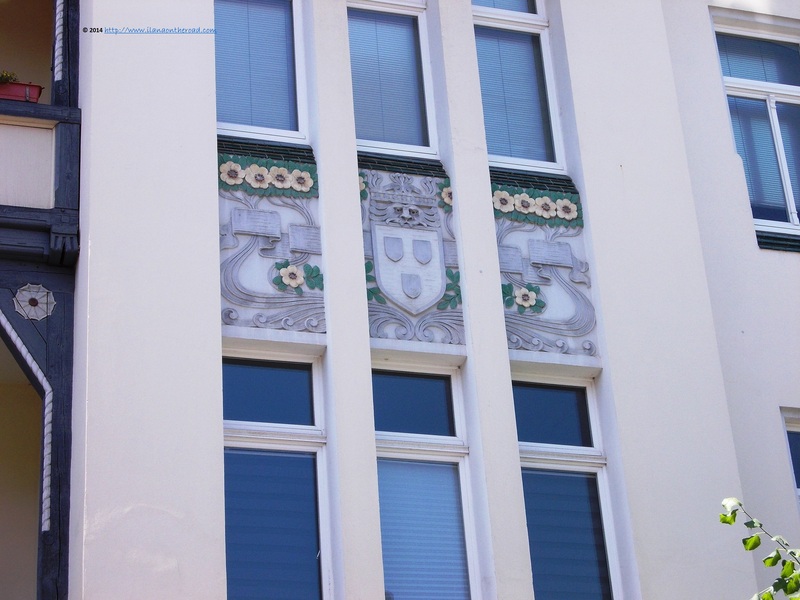 The pharmacy is advertising products 'made in Harz', a region very rich in a special flora, used extensively for the secret centuries-old recipes of the herbalists. Most shops are closed though, refusing us the pleasure to discover more direct insights about Blankenburg. 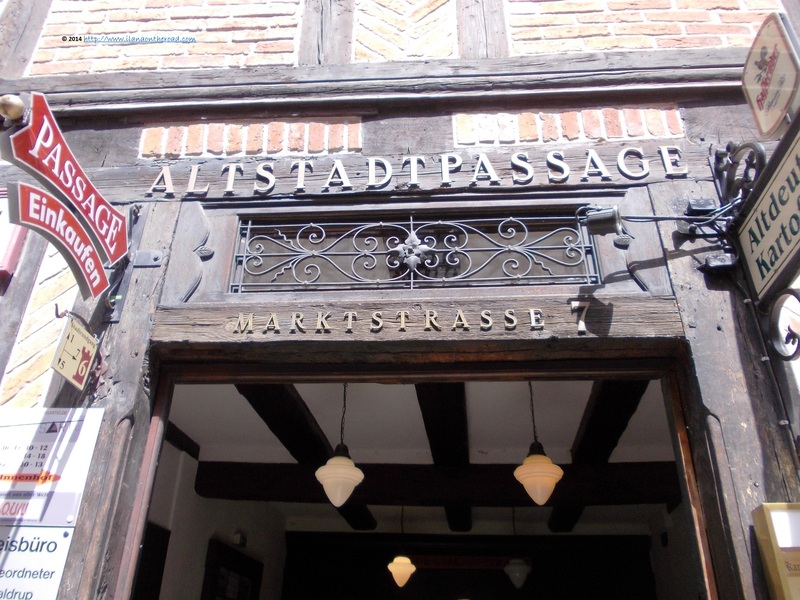 The Altstadt Passage is hiding some antiques and glass shops, but also some ice cream parlours and a German restaurant that are open for the Sunday, but without an impressive number of customers. The location of the lunch was decided long before we arrived in Blankeburg: Kutscherplatz, the Bulgarian restaurant, probably the only one with such a specific cuisine in the area. It is decorated with a lot of traditional items, not all of them eluding the category of kitsch. There are some old pictures, including some of the royal family that brings back some historical memories that keep me interested till the food arrives. But hopefully, I don't have to wait for too long. First coming: the complimentary traditional Bulgarian salad, with cheese, fresh cucumbers and tomatoes, an excellent idea that re-establishes the level of hydration after hours of walking in the hot sun, accompanied by bread with butter and spices. 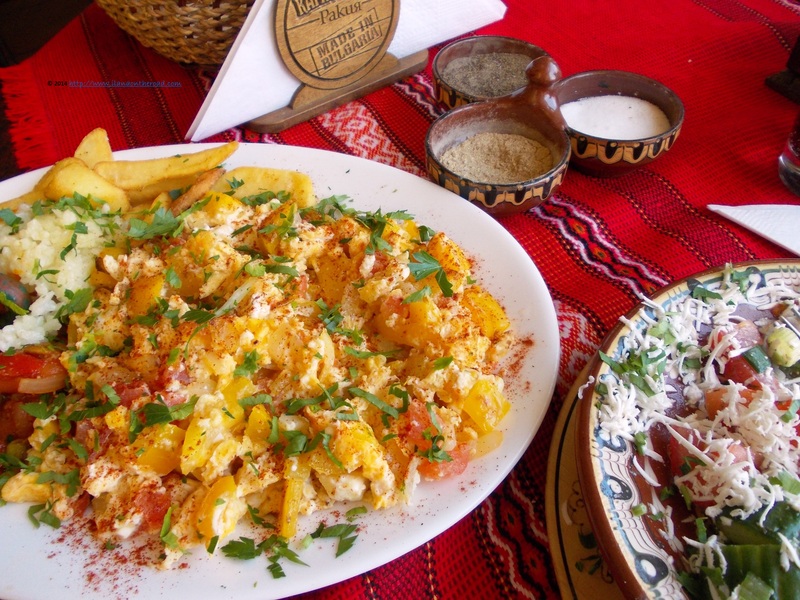 The main meal that I ordered is another traditional Bulgarian food: a combination of yellow pepper, scrambled eggs and various fresh veggies, accompanied by French fries and rice. Generous enough to suppress the hunger for the rest of the day and well done, although a little bit salty. Doing intensive research before a trip paid back, as there were not too many open restaurants around anyway. 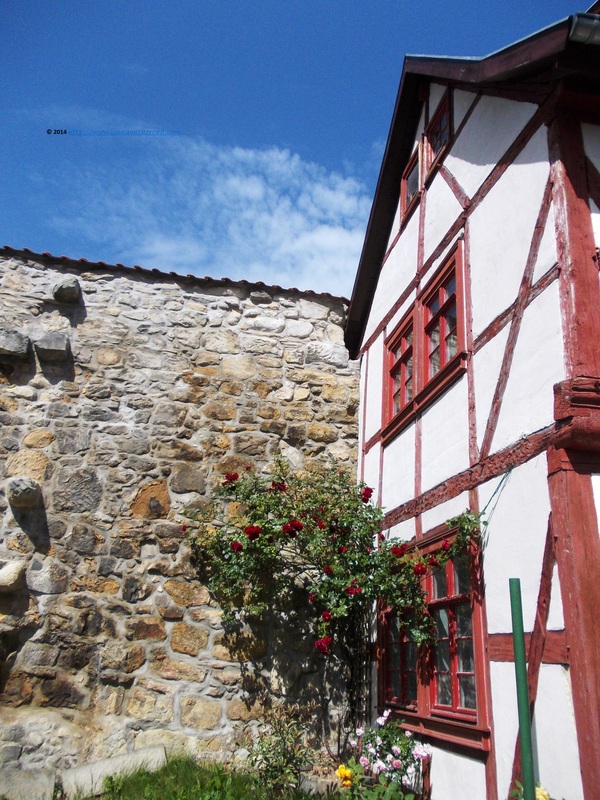 There are some risk if one choses to visit Blankenburg on a Sunday: do not expect a busy schedule. Most shops are closed, there are not too many museums to fill the time that you can otherwise spend in the front of a nice cup of coffee and transportation with buses might take time, as there are big time slots in-between. There is a high concentration of coffee places opened on Tummelplatz, if you have some time to kill, the square being very close to the old city area and the city hall. 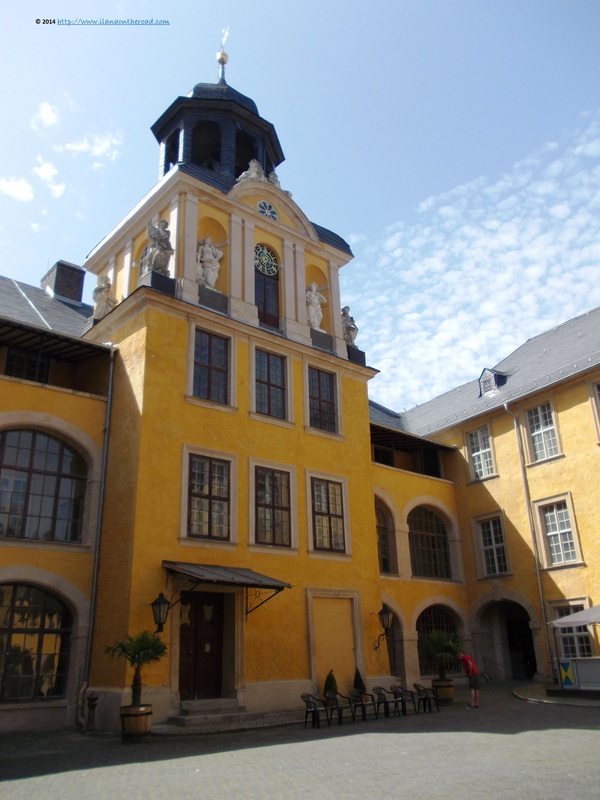 Schloss Hotel is the most elegant destination in town, with a welcoming terrace where to have some coffee or icecreams. As Blankenburg is an important destination on the German map of medical treatments, people from all over Germany are usually visiting the place and I was expecting a more diverse accommodation offer though. The rest of the hotel variety is between 2 and 3 stars, with a generous offer of renting from individuals, advertised directly in the front of the houses open to guests. But we are not interested to spend the night here, so we are spending more time walking. The parks are in full bloom and when we find the shadow, we can spend good time looking at the beautiful flowers. 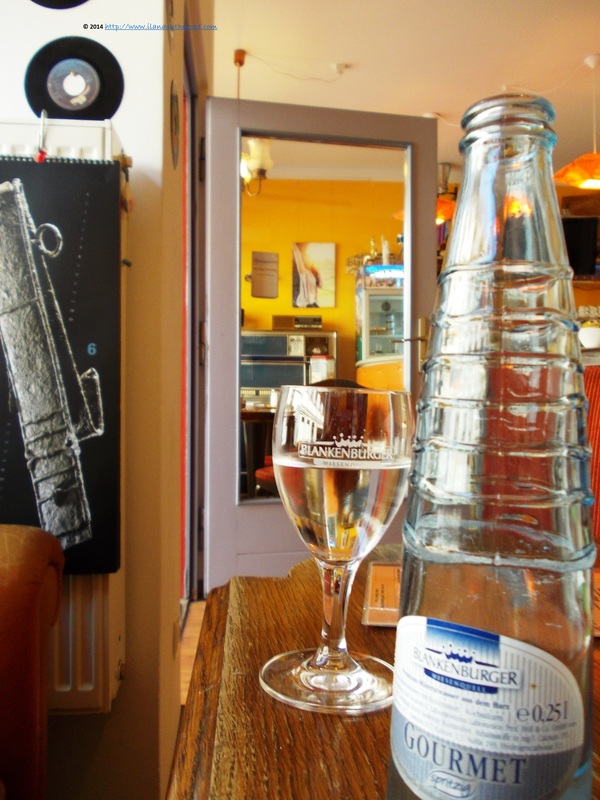 Otherwise, we are lucky enough to find a place open to buy some water: Nest Café, with its vinyls hanging up on the walls, various old radio stations used as exotic pieces of furniture and the fresh - not very cold according to the non-European standards - local water. We are grateful for the discovery, especially because we can have the taste of local products, and get ready to return to the big city. On the way to the train station, I had a feeling that there might be some more secrets left somewhere on the mysterious streets of Blankenburg, so if the autumn allows us, will be happy to be back again soon.